Did you know bats are the only mammals on earth that fly? And bats are expert hunters, catching about 600 mosquitoes an hour! 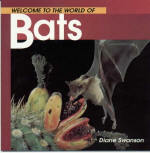 With stunning close-up photos and amazing text, this book will give you all the bat facts. This is a new book from an independent bookstore. It will have our removable price sticker on the back cover. We'll happily ship Priority Mail and International!